Some of the most dated and ugly decorating in older homes is in the bathroom. 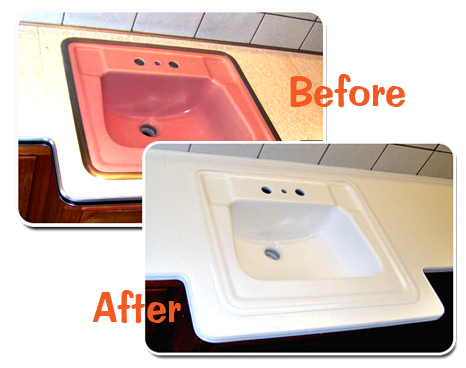 Fixtures of all colors can be found there and they are some of the most expensive items to replace. The cost of refinishing fixtures and tile is less than half the cost of replacing them. A total make-over takes less than a day and we leave the place cleaner than when we found it. There is literally no mess to clean up after we leave. Our professional refinishers will thoroughly prepare the old surfaces, followed by six coats of the most advanced polymerized acrylic urethane. On porcelain fixtures, our special bonding agent forces the new coating to expand and contract with the original surface as heating and cooling occur, preserving the integrity of the new surface for years to come. Tile reglazing gives owners of outdated bathrooms and kitchens the opportunity to revamp those rooms with a new splash of color. Customers can choose one of more than 1,000 designer coating colors. 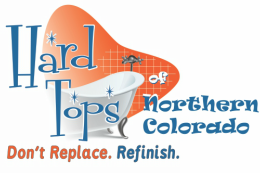 Hard Tops of Northern Colorado offers sink refinishing for all kinds of sinks and necessary sink repair. We offer reglazing for porcelain, fiberglass, and cultured marble.